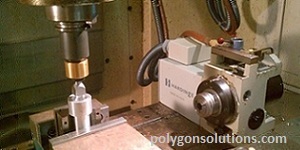 Rotary broaching is ideal for making small polygon shaped forms in soft metals. Soft metals include brass, aluminum and mild steel. 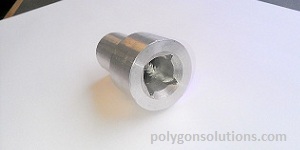 Polygon Solution’s standard catalog includes hex broaches 3/8″ and smaller, and square broaches 8mm and smaller. But what if you need to broach a form larger than these sizes, such as the 3/4″ square shown here? 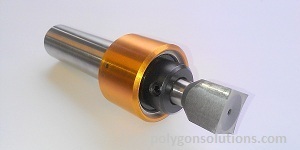 The Solution: Polygon Solutions manufactures rotary broaching tools larger than those found in the standard catalog, however broaching those sizes can be challening and may not be possible.For the best chance at success, consider these tips:1. The chamfer for the hole must be larger than the sharp corners or major diameter.2. The pilot hole should be larger than the flat-to-flat dimension or minor diameter.3. There must be plenty of room in the hole for chips to accumulate.4. The machine must have enough power to feed the tool into the hole. In this example, the 1/2″ shank broach shown here is a 3/4″ square and is fastened in Polygon Solutions GT Series premium rotary broach tool holder. The pilot hole is .835″ diameter. This is about 10% oversize which is ideal when rotary broaching squares. The broach and holder were put into a vertical machining center. Simple programming allowed the broach to be brought over the hole on center. The broach was manually fed into the hole using a speed of 1,000 RPM. As you can see, the chips curl into the hole. This is why it is critical to have room in the hole for the chips. It may be possible to use a smaller pilot hole if more of the square form is desired. However, this will add significant forces to the operation. 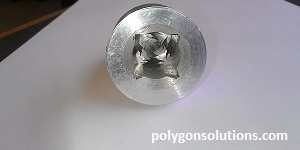 The chips can be removed from the hole with a drill or end mill if required. Rotary broaching large forms may not be successful, and can be affected by material hardness and tensile strength, pilot hole dimensions, machine thrust capability, and other factors. However, with patience and some testing, you may be able to broach forms like the 3/4″ square shown above.